Port Canaveral Transportation provides car service, limo service and ground transportation to Orlando, Central Florida, Winter Park, Maitland FL, Windermere FL, Florida Longwood, and any Central, North and South Florida location. Welcome to Port Canaveral a customer-friendly gateway to major consumer markets and leisure destinations. Strategically located on the east coast of central Florida, we offer cruise lines, cargo lines and shippers, businesses and vacationers the capabilities of a first-class deepwater port with the benefits of a uncongested setting and relaxed attitude. Cruise offerings from Port Canaveral include 1- to 7-day excursions aboard vessels from Carnival Cruise Lines, Disney Cruise Line and Royal Caribbean International, and partial-day with Sterling Casino Lines and SunCruz Casino. You are sure to find a cruise that suits your schedule and fires your imagination. 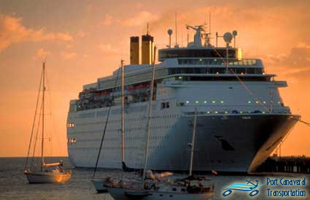 Carnival Cruise Lines was one of the first cruise lines to recognize the advantages of sailing out of Port Canaveral. It currently has three beautiful ships homeported here, including one of the largest on the seas today – the impressive Carnival Glory. Carnival offers 3- and 4-night cruises to the Bahamas, 7-night cruises to the eastern and western Caribbean, plus new 5-night itineraries. Click here for more information. Cruise Terminal 8 at Port Canavral is the only place on earth you can catch a Disney Cruise Line ship. The Magic and the Wonder offer vacationers the incomparable Disney experience on 3-, 4- and 7-night cruises to the Bahamas, the eastern and western Caribbean and Disney’s private island getaway – Castaway Cay. Click here for more information. Royal Caribbean International’s Mariner of the Seas has one of the highest space-per-guest ratios in the cruise market, plus state-of-the-art recreational facilities like a rock-climbing wall, ice-skating rink and basketball court. RCI offers 3-, 4- and 7-night cruises to the Bahamas, eastern and western Caribbean and private island Coco Cay. Click here for more information.